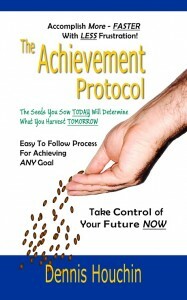 The Achievement Protocol (#AchievementProtocol) is now available in paperback! It is active on Amazon.com and through the author’s Amazon E-Store. 2) You need to order through this link to the e-store instead of the main Amazon.com website. After you’ve read the book, I would also like you to seriously consider going to Amazon.com and writing a review of the book. A quality review and appropriate star rating will help other potential readers know what to expect, and it will also help me to better understand what affects my readers. The initial release pricing will end at 11:59 pm PST on February 13th, or after the initial release quantity has been exhausted, whichever comes first. Please share this post on your Facebook page and let your let your friends know that they will have to sign up here and enter the word ACHIEVE in order to get the discount code. Have a fantastically productive Wednesday!